Here it comes again, another algorithm update that will have a profound impact on web rankings. That is, of course, if you are either the best of the best or the worst of the worst in content creation. For the best, you will see a boost in search due to providing quality and timely content. For the worst, low quality content will be the downfall of your company, or at least your search rankings. What can you expect? How can you recover? How do you avoid taking an eBay sized hit? Google’s Panda algorithm is designed to prevent sites with poor quality content from working their way into Google’s top search results. Google told Search Engine Land that Panda 4.0 affects different languages to different degrees. In English for example, the impact is roughly 7.5% of queries that are affected to a degree that a regular user might notice. All of this can be viewed in Google Webmaster Tools or Google Analytics, both acceptable for finding out key metrics including user flow, acquisition, bounce rates, and much more. Who gained search rankings as a result of Panda 4.0? Who lost ground? Thanks to a recent post in Searchmetrics, a search analysis company, they looked at the biggest gainers and losers of visibility on Google. For the full list, head over to Searchmetrics to see other major winners and losers of Panda 4.0. Create a Plan: Build an editorial calendar that will allow you to know what you should post and when you should post it. Develop and Implement a Content Process: Anywhere from taking on a new employee to hiring an outside firm, you need someone to effectively implement your content marketing and SEO strategy. Build an Authentic Brand: Who knows the topics better than you? Why should you steal other people’s (possibly competitors) work? Share your expertise with your customers. Be Careful with whom you work: If someone can ‘Guarantee Page One’ within weeks or write an article for $5, you will not enjoy the results. You are the expert, a credible marketing agency can act as the expert, but a questionably sourced marketer you found on Fiverr probably isn’t. 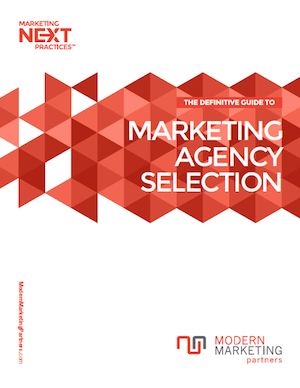 If you want to know about things to look for in a marketing agency, we offer a marketing agency selection guide free of charge. Distribute: Don’t fail to recognize that you need a well-timed distribution strategy. Part of your editorial calendar should include a documented list of distribution to build an avid following. Content distribution through social media is a viable business need to build followers. Capture and Convert: Lead generation, social media, and customer development all tie together. As you distribute and create, understand that there are viable needs to create a funnel. Get the most out of your content, get more out of your SEO, and build your business. All part of a long term strategy, this is an area in which Modern Marketing Partners, a Naperville Marketing Agency, specializes. Follow us on Twitter, Join us on LinkedIn, and contact us to improve your B2B marketing strategy.